Truth About It.net’s D.C. Council: setting the scene, providing the analysis, evaluating players, and catching anything that you may have missed from the Washington Wizards. Game No. 11: Wizards vs Cavs at the Verizon Center; contributors: Lawyerin’ hoops fan Jeremy Feldman (@jfeld628) and ya boy John Converse Townsend (@JohnCTownsend), who were both at the Phone Booth last night. That Session Was … A Statement Game. Coming into Friday night’s game, though the Wizards sported a strong record (7-3), every single one of the team’s wins were A) relatively close and B) against the dregs of the Eastern Conference. The team’s best win of the season thus far was either a home victory over the Bucks or a road win in Indiana. A visit by LeBron James and the Cavaliers presented a new challenge and the chance for Washington to notch its first signature win. After falling behind 13-8 early, the Wizards turned the tide, quickly took the lead, and never looked back. The Wizards were boosted by the best home crowd of the young season, playing a high energy game and, frankly, bringing more intensity than the Cavs all night. They dominated the paint on both ends of the floor and rode a superstar performance by John Wall. At the end of the night, Washington was a convincing 91-78 victor over the team favored to win the Eastern Conference, and the 13-point differential was the team’s largest of the season. The team also executed a sound defensive gameplan and held the Cavaliers to just 36 percent shooting. As Bradley Beal said in the locker room after the final buzzer, “defense is what won us the game from start to finish.” Emphasis on finish—when the Wiz managed to score only 11 points in the fourth quarter, the defense held the NBA’s second-best offense to just 13, and didn’t allow the Cavs to make a single field goal in the last nine minutes. Sure, some of the Cavs’ outside shooting struggles were self-inflicted, but the Wizards were crisp in their rotations all night, kept the intensity high, and made nothing easy. Washington is now 8-3, 2nd place in the Eastern Conference, and the owners of a quality, no-doubt win. John Wall averaged 19.3 points and 10.3 assists in four games against the Cavs last season—helping the Wiz win two. 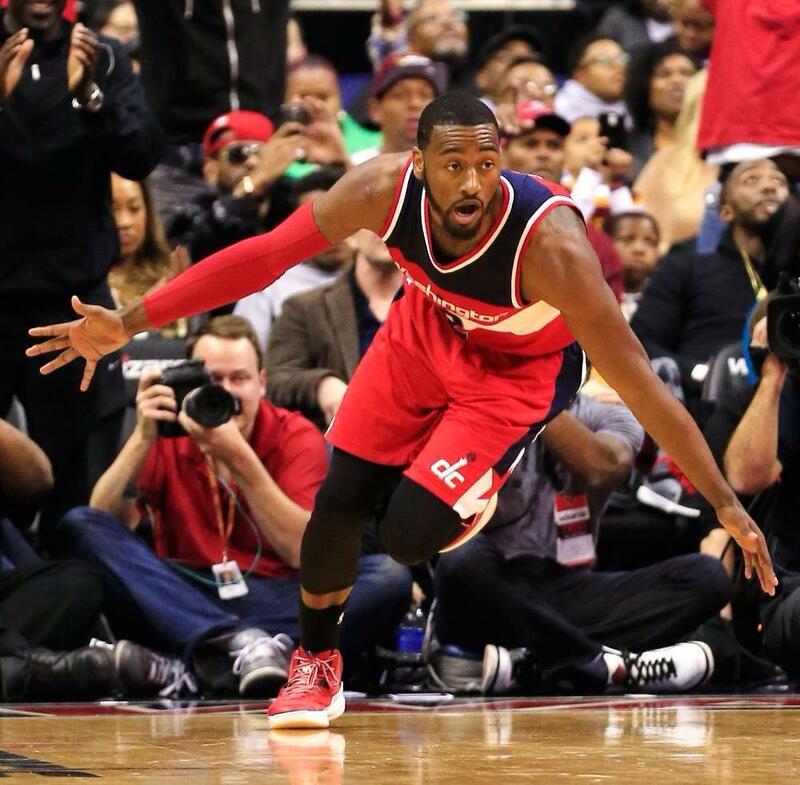 On Friday night, in front of a sold out arena, Wall again had his way against Cleveland—this time stronger, star-studded and championship-focused. Wall—in typical, humble fashion—credited his teammates for their focus and response to Cleveland’s third-quarter push (they got within seven, 60-53). But the Game Changer was just that. He didn’t just close the door on Cleveland’s comeback attempt, he slammed it in their collective, pouting face. He was responsible for 19 of the Wizards’ 25 points in the decisive third quarter, scoring 17 points on nine shots, including a 3, and feeding Marcin Gortat for an easy two. The home team led by 15 going into the fourth. Unfortunately, Temple’s slide continues after his excellent start to the season. For one more night, Temple maintained his status as the Wizards’ starting shooting guard, but he was a mess in this one. Within the first five minutes of the game, Temple committed an ugly turnover when he sloppily dribbled into a double-team, badly missed a wide-open corner 3, got caught out of defensive position on a Shawn Marion drive, and had his inbounds pass intercepted by Kyrie Irving. After the Irving steal, Wittman called a timeout just so he could yell at Temple and send him to the bench. To the surprise of some, Wittman did bring Temple back in for the first five minutes of the third quarter, and his performance was certainly less disastrous. Temple has shown that he can contribute solid minutes for this team, but he probably shouldn’t be a featured player. LeBron James shot 8-for-21 from the field and finished with 22 points. But the man who fancies himself a king, or god, depending on the day, was just 1-for-8 from the field when guarded by Paul Pierce, per ESPN Stats & Info. LeBron’s average shot distance on those attempts? Twenty-five feet. That defensive effort (90% anticipation, 10% perspiration) earns Pierce recognition as the game’s Top Aide. His efficient scoring night: a nice bonus. Though he scored only 12 points and struggled at times with his shooting stroke, the all-around game Beal displayed Friday night was critical to the Wizards’ victory and gives hope that he’s primed to make “the leap” this season. Beal played strong perimeter defense, hit the boards hard, and facilitated for his teammates all night. The Wizards outscored the Cavaliers by 24 points in Beal’s 32 minutes on the floor. With the Wizards offense struggling mightily in the fourth quarter, he hit a big 3 with 1:30 left to put the Wizards up 12 and put the game out of reach for good. Criticize Nene for his incessant pleas for fairer treatment. Go ahead, criticize him for not being as big of a presence on the boards. But don’t say he isn’t a difference maker on the defensive side of the ball. Certainly don’t say he’s been “horrible.” His DefRtg, 91.2, is third-best on the Wiz, but only focusing on advanced statistics (like his just-OK 100.7 OffRtg) means you miss the big picture. He does so many little things that don’t show up on the box score (and on offense, so many things that do). Kevin Seraphin… KEVIN SERAPHIN! All hail the Cayenne Killer. He had a solid game. Another solid game. It’s been something of a breakout year for #KSLife. But here’s the thing: This is the mostly the same Seraphin we’ve seen since he was drafted in 2010 (his defensive awareness and ability is better). He scored 12 points on 11 attempts, which translates to 1.09 points per attempt—about his career average 1.08. Want “wow” factor? He currently leads the NBA in hook shot field goal percentage at 87.5% (min. 10 attempts). However, he was fifth last season (74.5%) and the year before (72.9%), and Seraphin was top 10 in hook shot FG% in 2011-12 and fourth as a rookie … we’ve seen this type of low-post scoring from Seraphin.